Miloslav Jaroš - born in 1977 in Žilina. Graduated from the Faculty of Philosophy, Constantine the Philosopher University with a degree in aesthetics and folklorism in Nitra. Works as a guitar teacher at a private primary art school. Miloslav started to do woodcarving in 2005 and became an ÚĽUV producer in 2007. 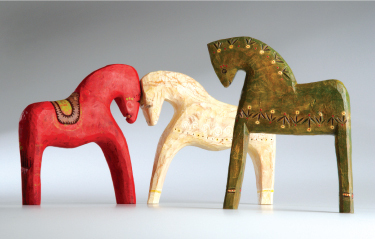 Miloslav makes small horses, birds, musicians, angels etc. and uses splitting, firing, notching, sawing, filing, rasping and grinding techniques. Miloslav adds colours by smoking with cheese, steaming in ammonia, painting with tempera and aniline dyes by adding priming coat. He makes final touches with linseed oil, shellac, dammar or spray varnish.